Warning: The following article contains spoilers. 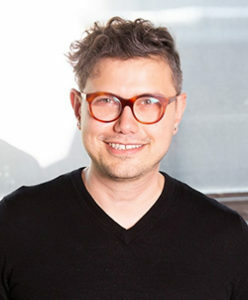 But as director Evren Odcikin said, context means everything when it comes to cross-cultural representation. Without context, the beauty and intention of art is lost; the artist is forgotten. 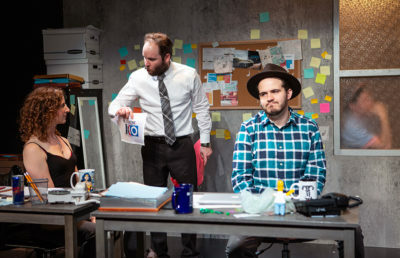 On its opening night of Aug. 30, “Kiss” shook the audience to its core through a roller coaster of a play rife with plot twists that served to provide this context. The unforgettable show demanded that one learn and understand the context of living during the Syrian Civil War. So while the play started off eliciting laughs through a seemingly melodramatic parody, it ended up bringing tears to the audience members’ eyes as it represented the reality of the brutal war. It’s an unquestionably phenomenal play with themes and images of Syria that will stay with you even after the curtain closes. So why did “Kiss” begin with a bad play? This beginning scene showcased what an American interpretation of a Syrian play might look like: melodramatic and off target. The actors delivered the lines with melodramatic tones and the effect was a parody of soap operas, in which love is the only problem. The four main actors (Roneet Aliza Rahamim, Elissa Beth Stebbins, Wiley Naman Strasser and Phil Wong) in this scene were faced with a love triangle. Hadeel is sitting in her living room at home, waiting for her boyfriend Ahmed to come home, when Ahmed’s friend Youssif shows up. It isn’t long before Youssif is professing his love to her, his close friend’s girlfriend. And this is followed by Hadeel’s own intense profession of her love for Youssif. This suddenly intense exchange becomes hilariously awkward as the two characters express this overt love and lust, and as they navigate how to tell their respective partners of that scandal. The love affair unfolds. Hadeel has screaming matches with Youssif, Ahmed and her friend Bana, Youssif’s now ex-girlfriend. Suddenly, Hadeel collapses — she’s dead. Then Bana jumps from the apartment window. The play within a play ends and nothing really makes sense. However, after a break in the fourth wall and a major plot reveal, the rest of the play that follows is a series of revelations that shock. The American actors who play Hadeel, Youssif, Ahmed and Bana learn that they’ve made a classic mistake as well-intentioned American liberals: They’ve completely overlooked the cultural context. But the context wouldn’t ever have been made clear if not for the actors. They performed in the simple set of a living room that in fact hid a lot of tricks in its back pockets. 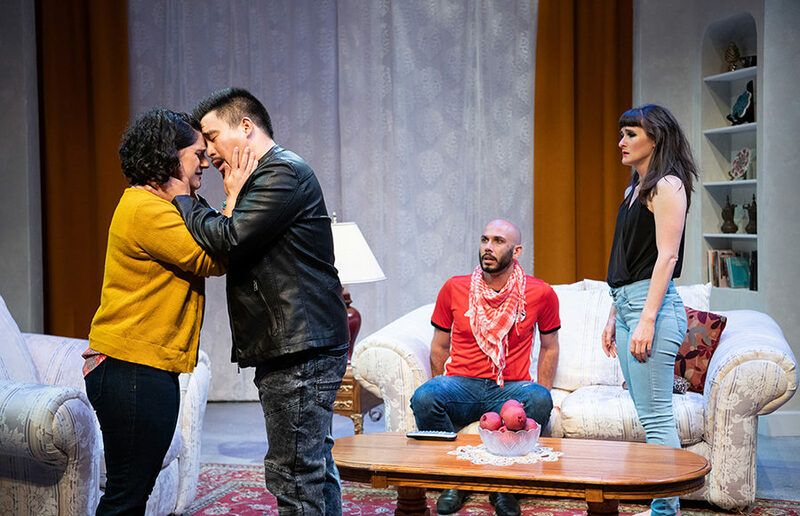 The actors successfully used their bodies and their voices as mediums to transform the play from kitschy to tear-jerking, and the crowd from laughing to awestruck and silent. Stebbins, especially, stood out with her booming voice and malleable posture throughout the play. Depending on her intention, her words could float lightly or sink in deeply. Other actors could have stood to use a similarly subtle technique — at times, the attempt to be dramatic and profound was so unintentionally overt that it was ineffective. That is not the case for Rasha Mohamed. As we listen to Mohamed’s character, we are asked to question our own assumptions. When you’re making a play about Syria, is it possible to forget that chemical warfare is in the ether? That gunshots in the background are a given? That a bomb could go off any second now? “Kiss” says it’s possible to forget — if you’re American and you’re lacking context. 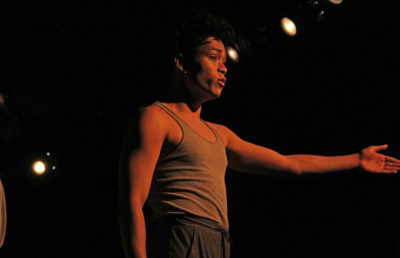 “Kiss” is playing at Shotgun Players in South Berkeley until Sept. 23.